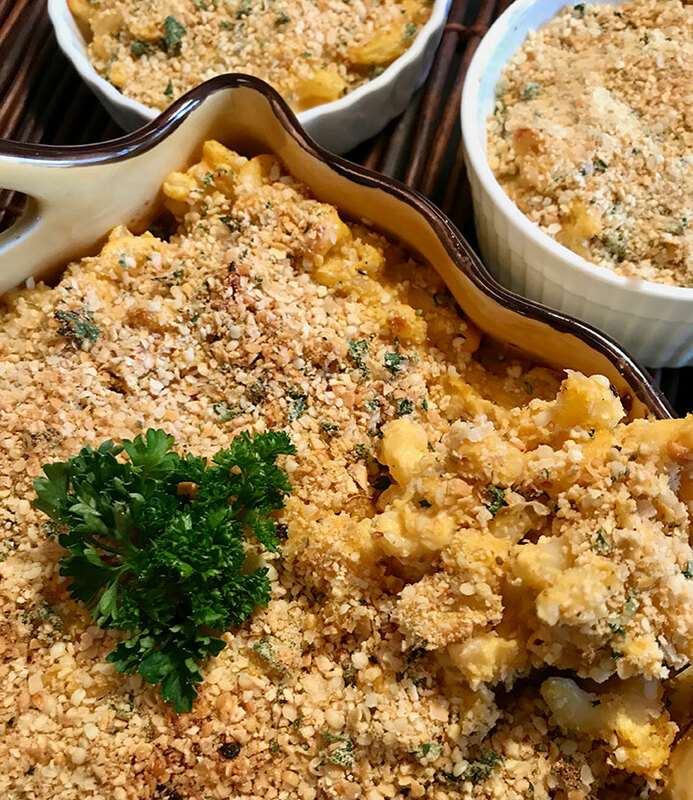 Creamy mac ‘n cheeze with a crispy seasoned crumb topping. This recipe uses a sauce base of steamed carrots and potatoes with non-dairy milk and just the right seasonings. 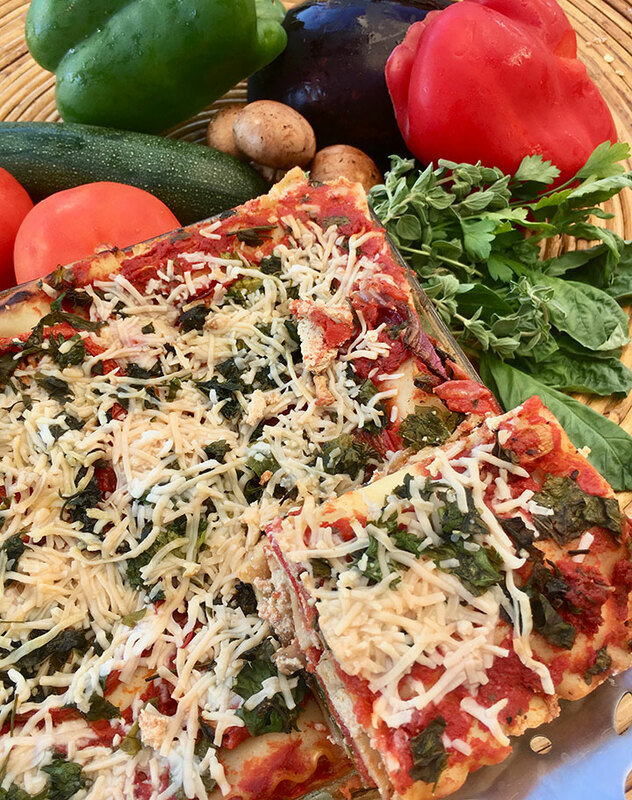 Vegan specialty parmesan is mixed in both the sauce and the crust. The crumb topping is seasoned breadcrumbs or a gluten-free alternative mixed with hemp seed, freshly chopped parsley and more vegan parmesan. Simple and smart…and no fishy business. It looks and tastes like ceviche, if you didn’t tell people it wasn’t they might not know the difference. 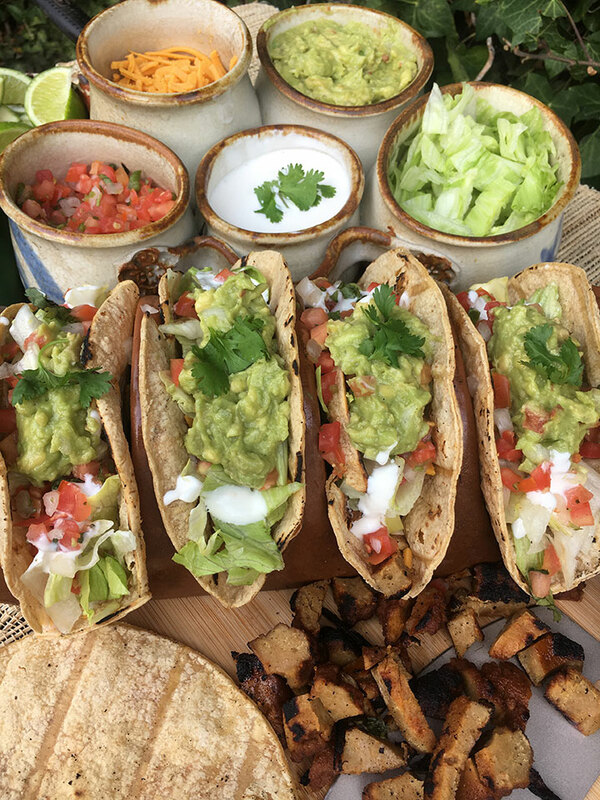 Combine a pint of fresh pico de Gallo with a chopped hot house cucumber, fresh cilantro and seasoned rehydrated textured vegetable protein and serve with fresh chips and an avocado garnish. You can have it all again plant-based. Tastes like chicken! This chick’n sandwich is really good! 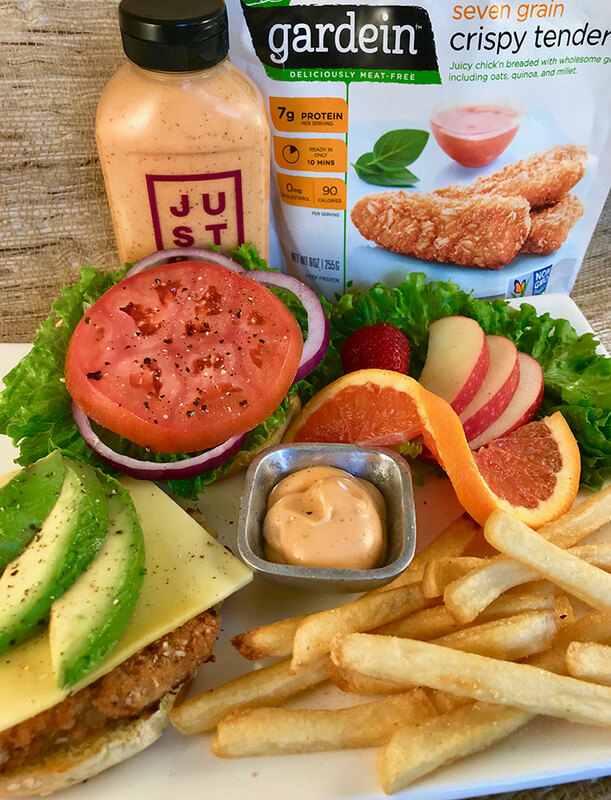 Chipotle mayo, avocado, Chao creamy vegan cheese and Gardein’s seven grain crispy tenders on a toasted bun with lettuce, tomato and onion. Severed with a side of fries and some extra chipotle dipping sauce, that’s a meal. On the menu at many popular vegan restaurants and delis. We’ve cracked the code on making this popular sandwich at home. It’s a hot deli sandwich favorite. 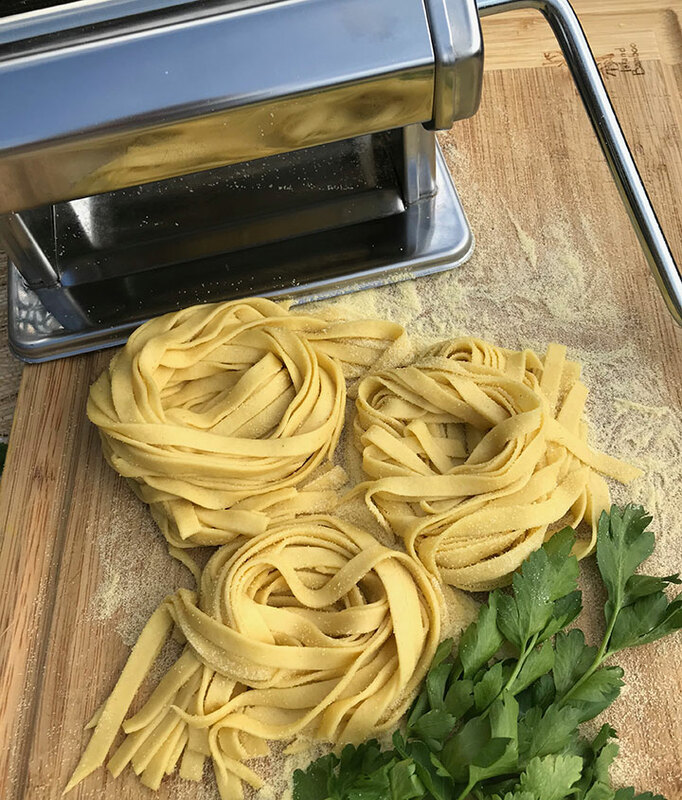 Fresh hand-made artisan pasta. Made with Bob’s Red Mill Semolina flour, tofu, olive oil, water and a pinch of salt. The base recipe for not only cut noodles but ravioli too. Make it at home. 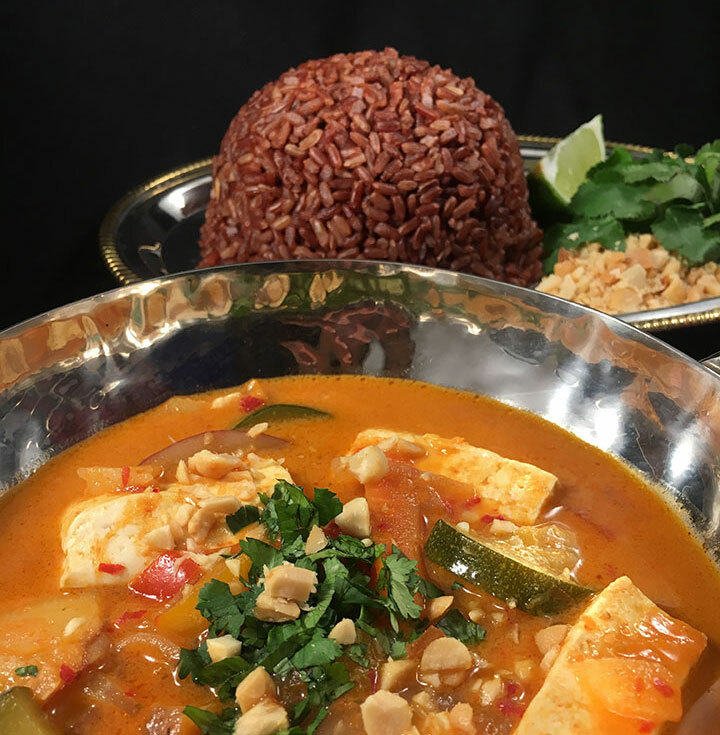 The combination of toasted red chilis tamari, brown sugar fresh ginger, garlic, and dry sherry or rice wine create a rich sauce over sautéed veggies (try pineapple too), golden tofu, and toasted peanuts served with fresh Jasmine brown rice. No difference. 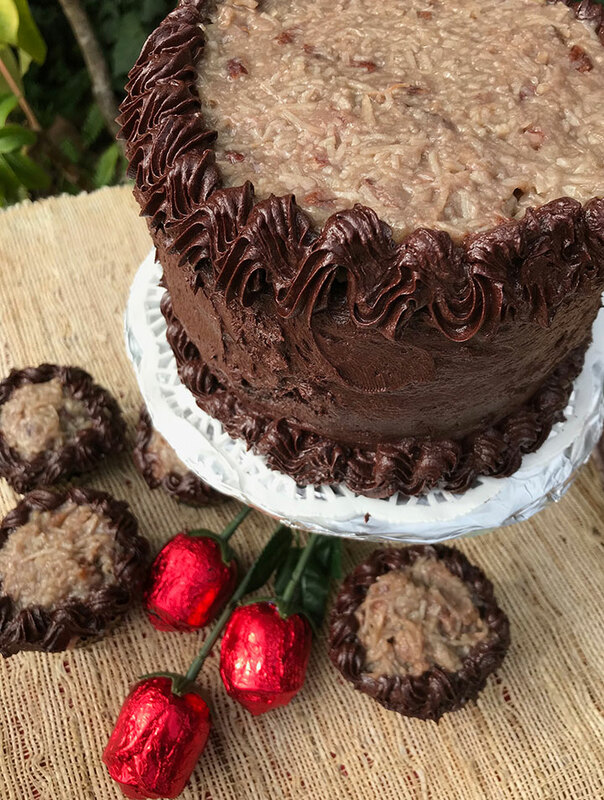 No one needs to know it’s vegan, it’s just delicious chocolate cake with a coconut pecan filling and chocolate fudge frosting. Try it with vegan ice cream for a nothing left to be desired dessert. Tofu is the new white meat. 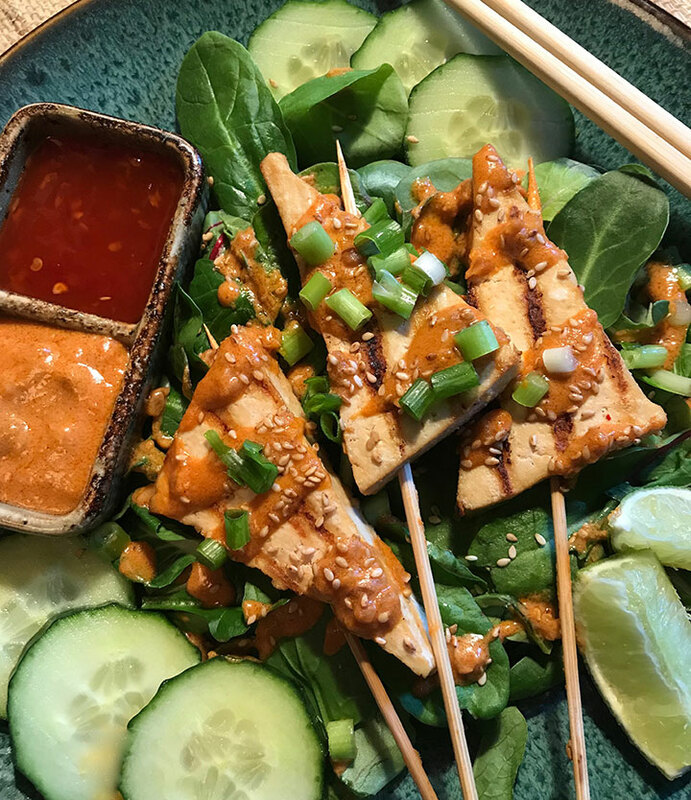 Marinated and grilled organic artisan extra firm tofu has all the same flavor, texture, and satisfaction that it’s meat-based counterpart offers…only it’s better with zero cholesterol. Complete with vegan feta and gyros strips, this entree salad has all the flavor, texture, and satisfaction of it’s meat and dairy based counterpart. Served with a fresh lemon herb, red wine vinegar and olive oil dressing. Served with hot pita bread and your favorite hummus, babaganoush or tzatziki. A nice warm bowl of satisfaction. 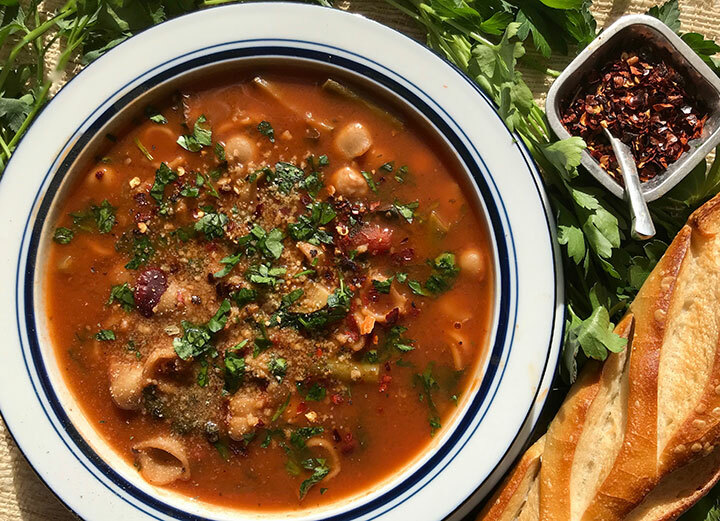 Loaded with fresh herbs and vegetables, beans, pasta shells, and an optional cup of red wine and served with a side of garlic bread. Nothing left to be desired, delicious! You can have it all again plant-based. This traditionally meat and cheese heavy party tray is complete with Miyoko and Daiya vegan cheeses, Field Roast Sausages and Tofurky deli meats, then presented with lots of fresh vegetables, fruits, nuts and dips, party heaven on a platter. A super easy solution to holiday cooking. You can make them from scratch or go the quick and easy way. Simply bake the roast with assorted winter vegetables and you’ll have a great center of the table entree. Substitute the traditional dairy and eggs in your holiday cookies with vegan alternatives and no one knows the difference! 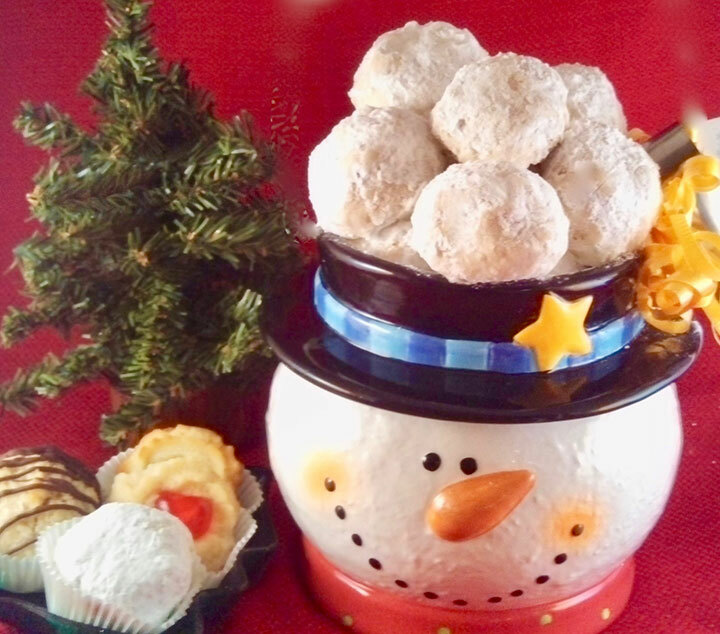 Share the joy of the holidays with recipes for vegan snowball and roll-out sugar cookies. 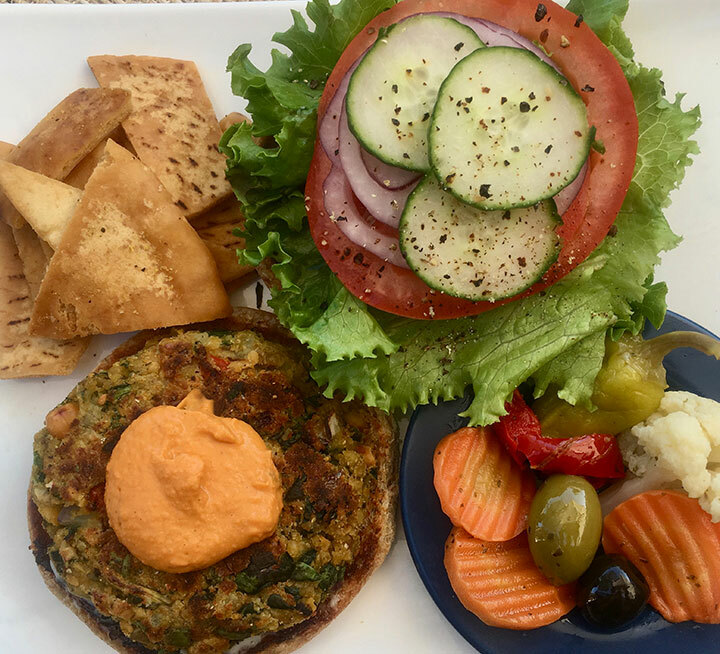 A Starbucks inspired recipe veganized. I used to love the maple icing covered scones at Starbucks, until I discovered they were loaded with dairy. This non-dairy version is so close to the original, no one would know the difference. An incredible “meat” sauce that has all the flavor and satisfaction. Tested on about 150 high school students, this recipe is a big winner and easy to make! Dairy-free decadence. Vegan cheesecakes are a rich, creamy, wonderful dessert. 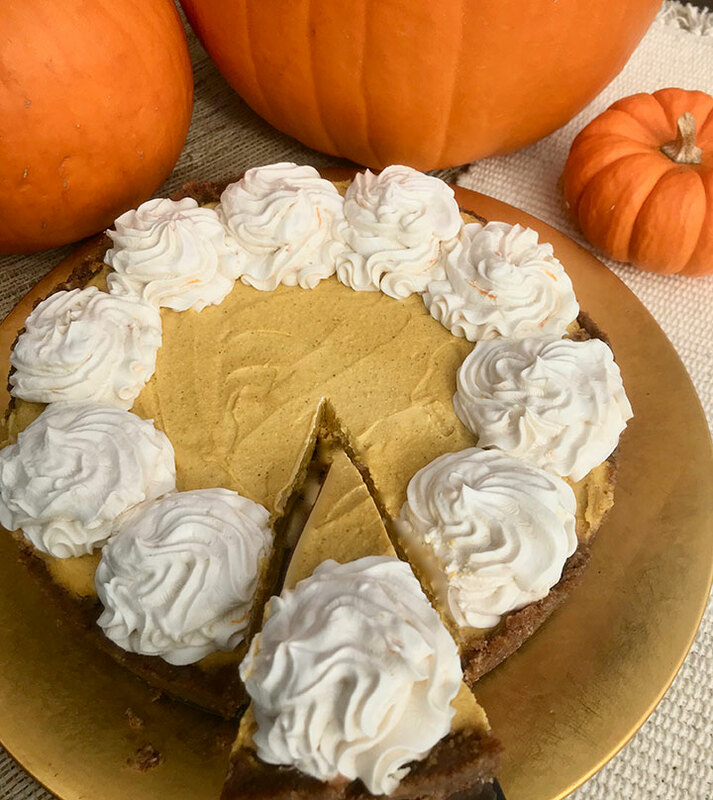 Made with a base of soaked cashews, pumpkin puree, and organic tofu, this holiday specialty is a surprising pleasure. Tamales made easy. The masa in traditional tamales is made with manteca de puerco or pork lard and chicken broth, then they are filled with meat and cheese! You can have it all again plant-based with the switch of a few ingredients and still get all the flavor and satisfaction. 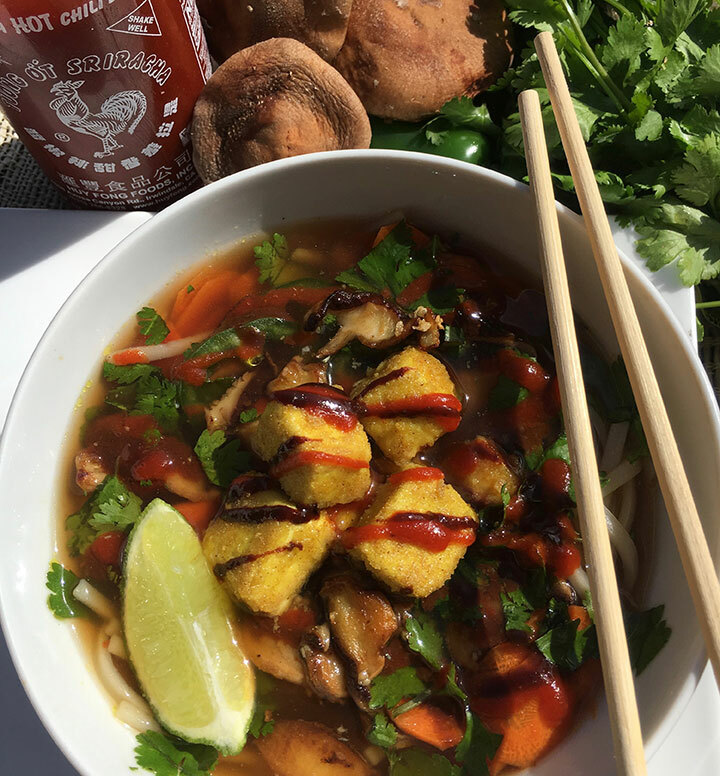 A bowl of spicy freshness with crispy delicious tofu. 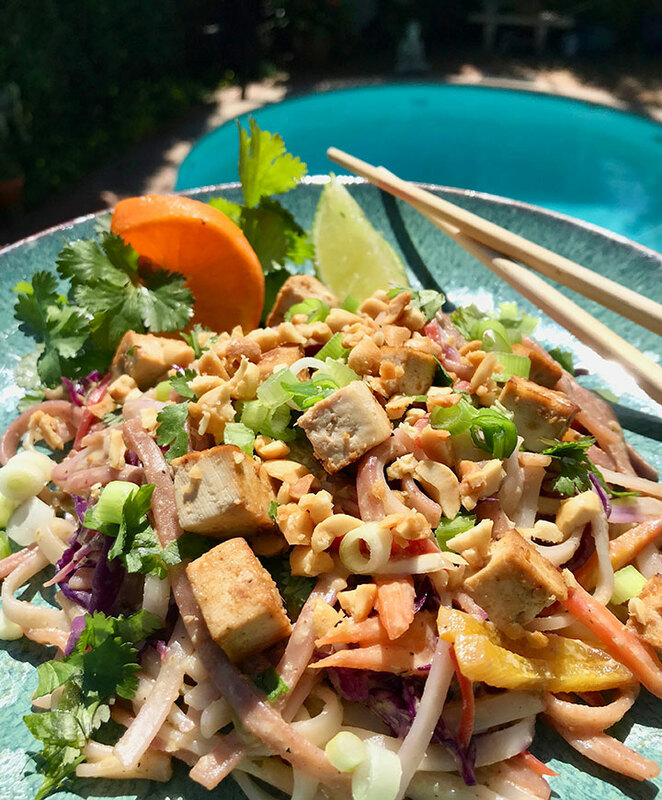 Toasted cinnamon, anise, and cloves and a variety of fresh vegetables with rice noodles make this a super healthy satisfying meal. The crispy tofu is so good you’ll have a hard time saving enough for the soup! 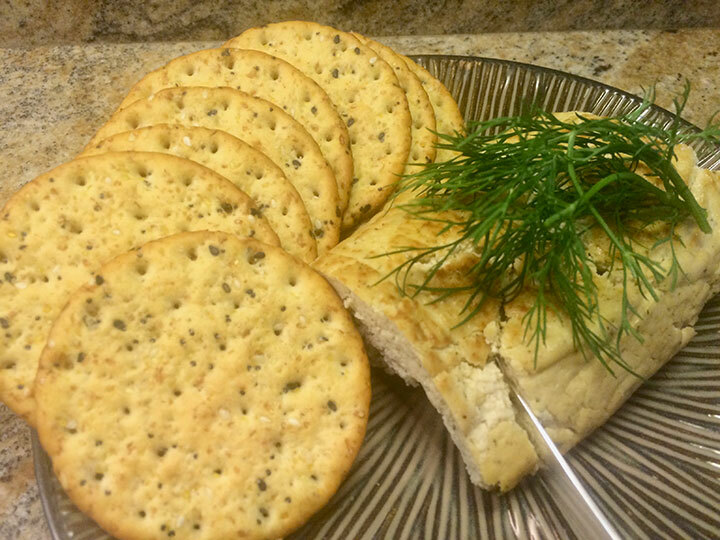 Organic artisan tofu can be transformed into a variety of vegan cheeses. Serve this cheese hot or cold. It’s great crumbled into pastas and salad. Wach for ingredients in your choice of crackers. Many contain milk powder and are not vegan. Warm, satisfying and delicious. Traditional recipes for Tomato Bisque use chicken broth and lots of dairy. 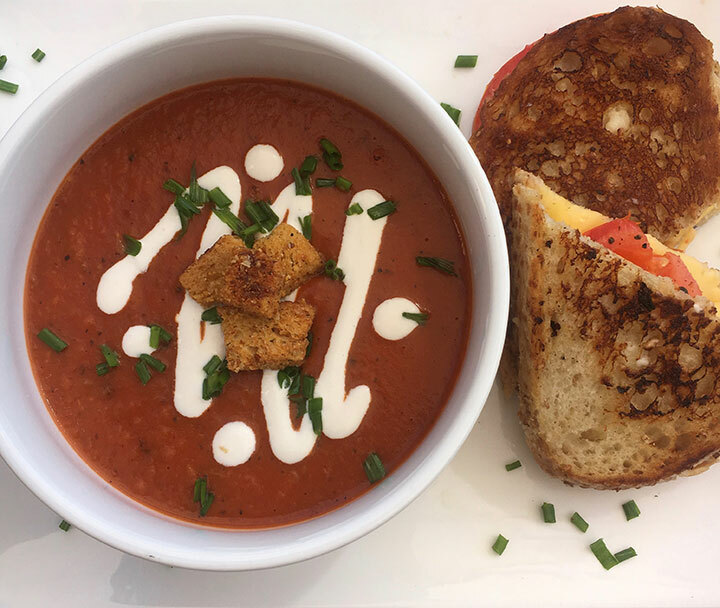 Try this plant-based version for all the same satisfaction and splurge on your favorite vegan cheese for an accompanying vegan grilled cheese sandwich, such a great meal. A new Octoberfest tradition. You can have it all again plant-based. This quick and easy meal is a favorite any time. 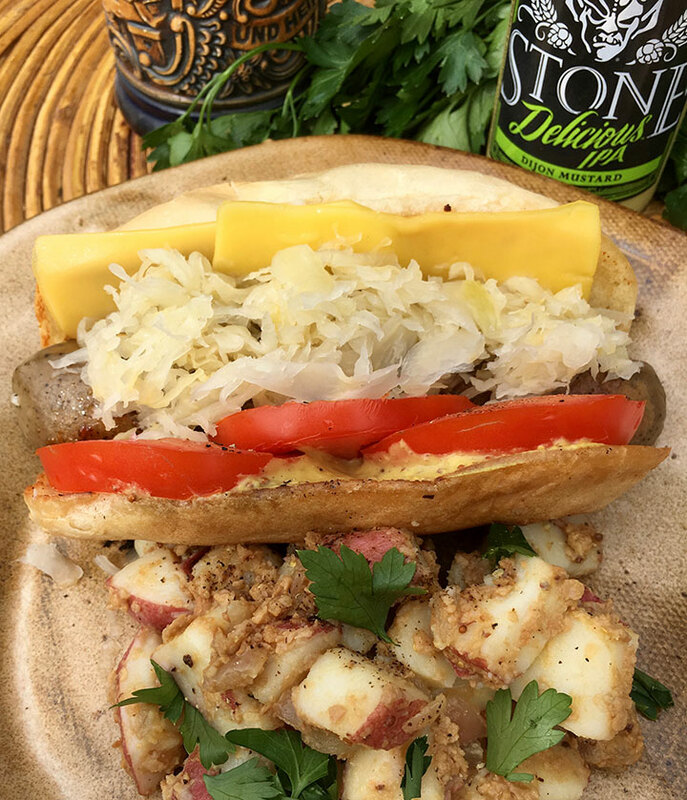 Grill Tofurky brats and toast a deli roll with creamy vegan cheese and top it all with your favorite mustard, sauerkraut, and fresh sliced tomatoes. Super delicious, so easy. 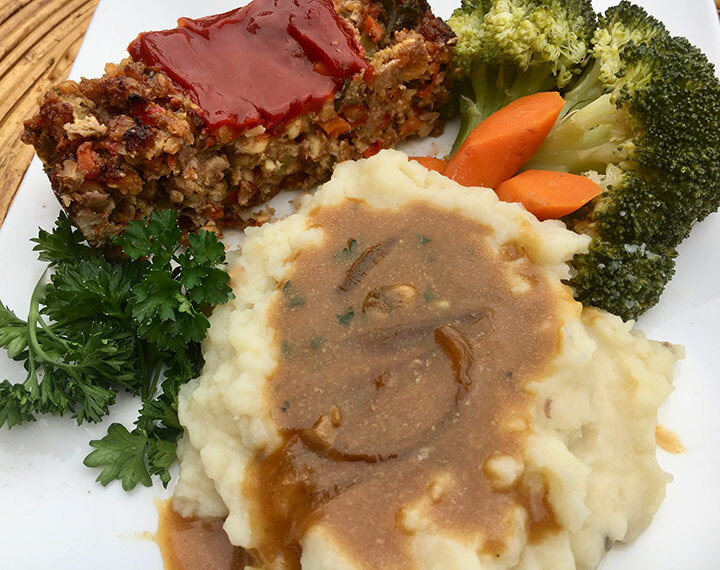 Today’s new meatloaf made with super protein rich tempeh and traditional veganized mashed potatoes and gravy. Many veggie burger recipes can also be baked into loaves, this one can also be used to make tempeh veggie burgers. Or take left overs and grill slices of the meatloaf for a great vegan meatloaf sandwich. A great menu item for entertaining, this is a recipe that can be made in advance and even freezes beautifully. Layers of grilled veggies, sauce, noodles (make it gluten-free), and a home made tofu ricotta cheese. 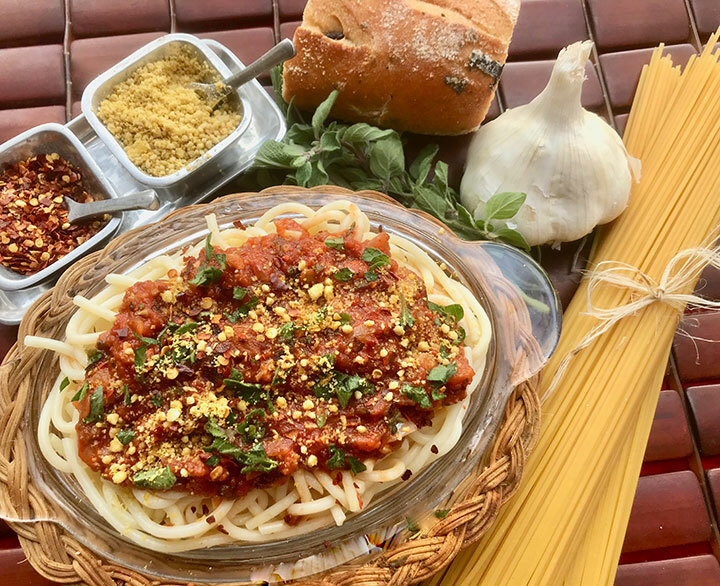 Try it topped with sliced tomatoes, fresh herbs and vegan parmesan. All the goodness of a hearty lasagne plant-based. Flavors of Greece Garbanzo beans, artichokes, spinach, red bell pepper, purple onion and olives are bound together with organic whole grain bread crumbs and seasoned with lemon juice, fresh oregano, sea salt and freshly ground black pepper. Serve with sides of hummus, antipasto, and pita chips. 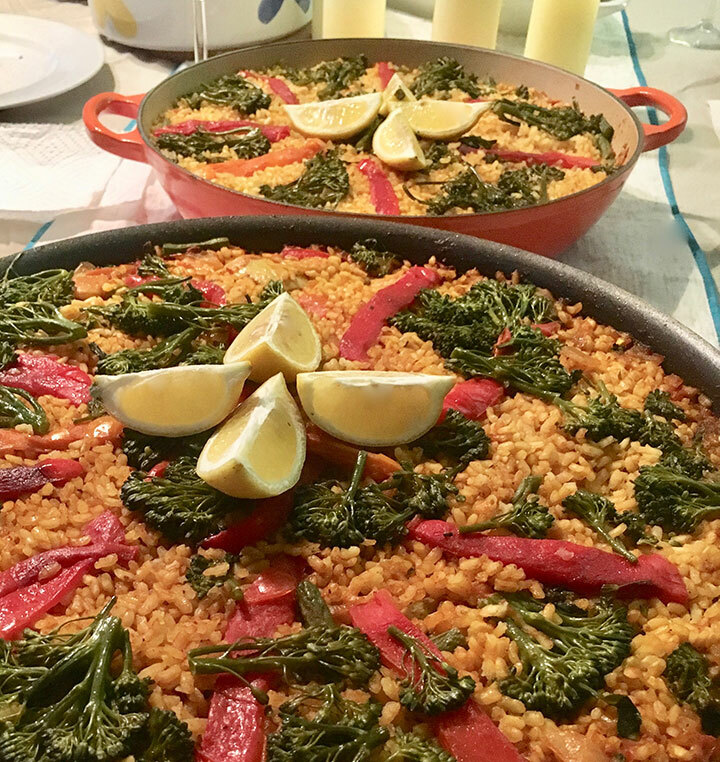 A taste of Spain. 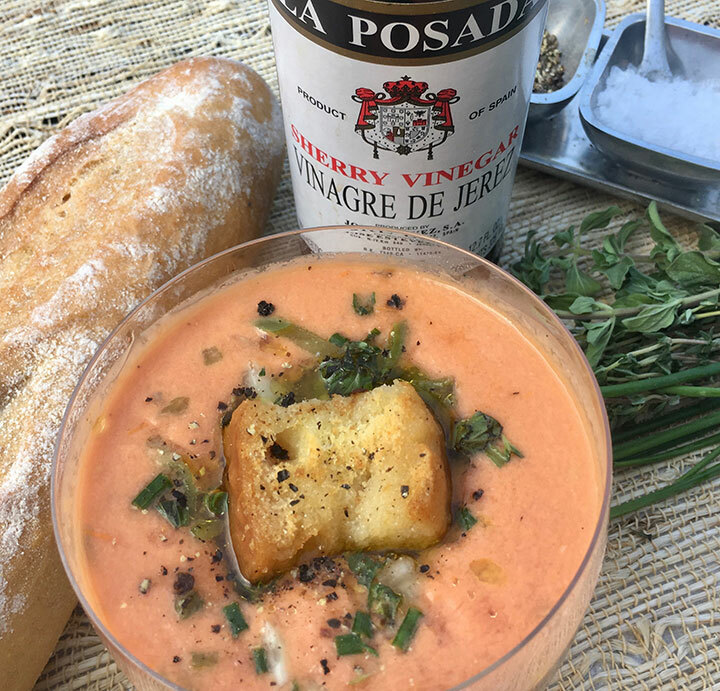 Blend together fresh tomatoes and veggies with a premium quality Spanish Olive Oil and Sherry Vinagre de Jerez for a cool and zippy classy soup that can be served as an entree in the summer or as a tapas appetizer anytime. Made with a base of garbanzo beans, artichoke hearts, and traditional seasonings, this a surprising healthy fun appetizer. 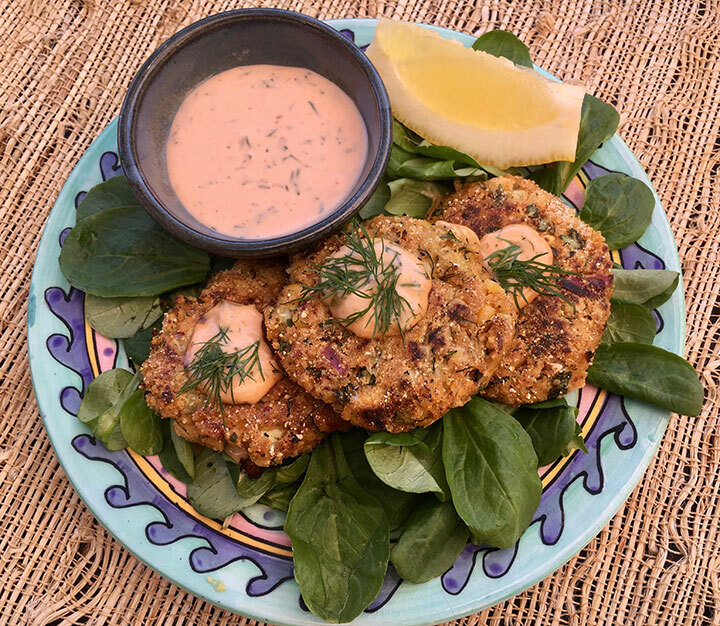 Vegan seafood is growing in popularity, serve these on a bed of baby greens with a homemade remoulade and a wedge of lemon. Delicious! Learn how to make hot vegan deli sandwiches at home. 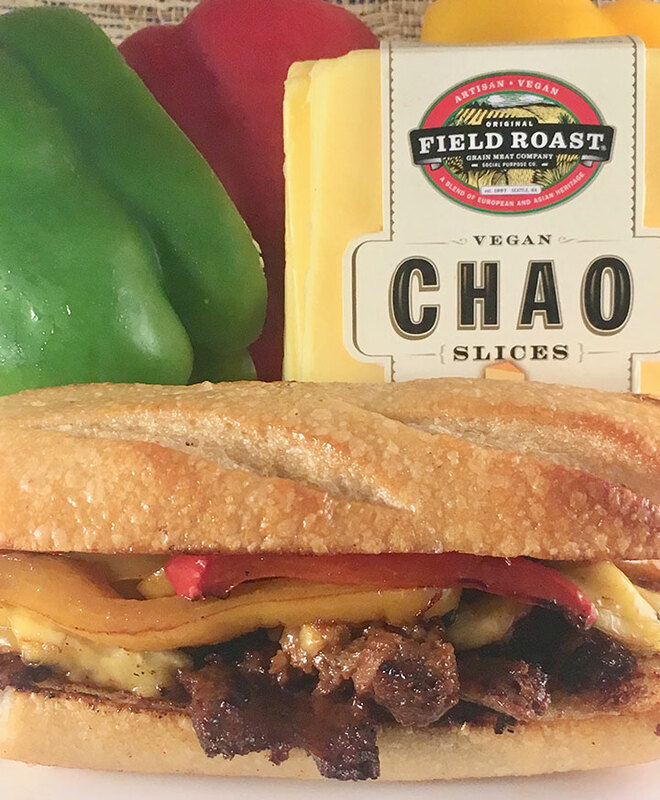 This incredible vegan version of the Philly Cheesesteak sandwich is made with super meaty homemade seitan, grilled veggies, and a rich and creamy vegan cheese all piled on a grilled ciabatta or French roll. Catch of the Day: Crispy battered or grilled fillet of zucchini. 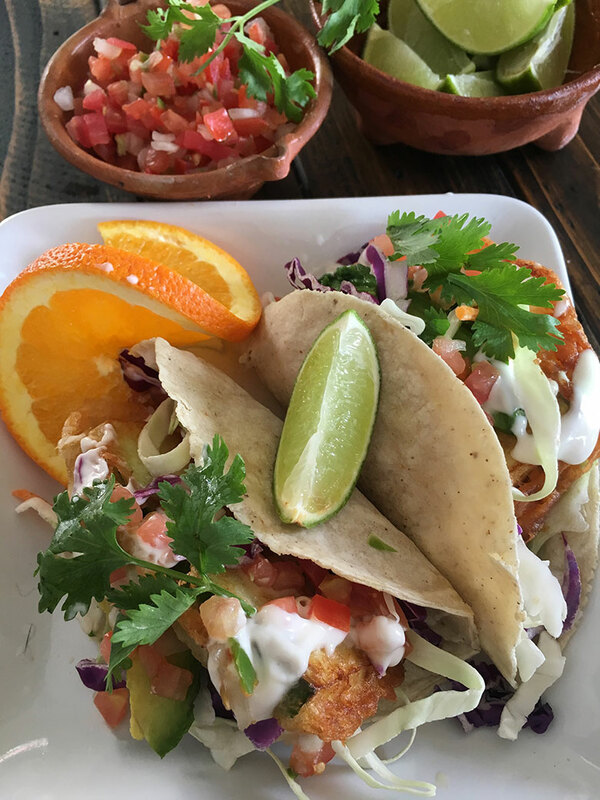 Served on warm organic corn tortillas with a white vegan sauce, mixed cabbage, pico de Gallo, avocado and a squeeze of lime. Watch out Ralph Rubio… this vegan version is on it’s way to taking over the original. 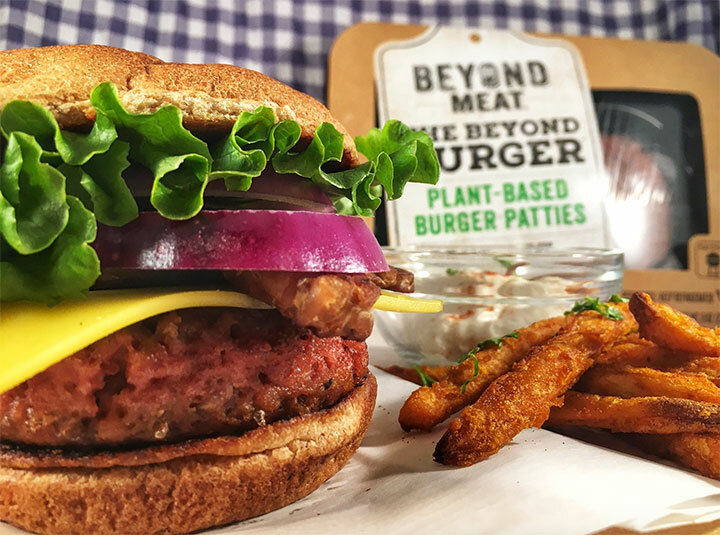 This leading brand of vegan meat is popular in a growing number of restaurants but you can make it at home too. Today’s plant-based foods can provide an experience so similar to eating real meat that lots of people can’t tell the difference! 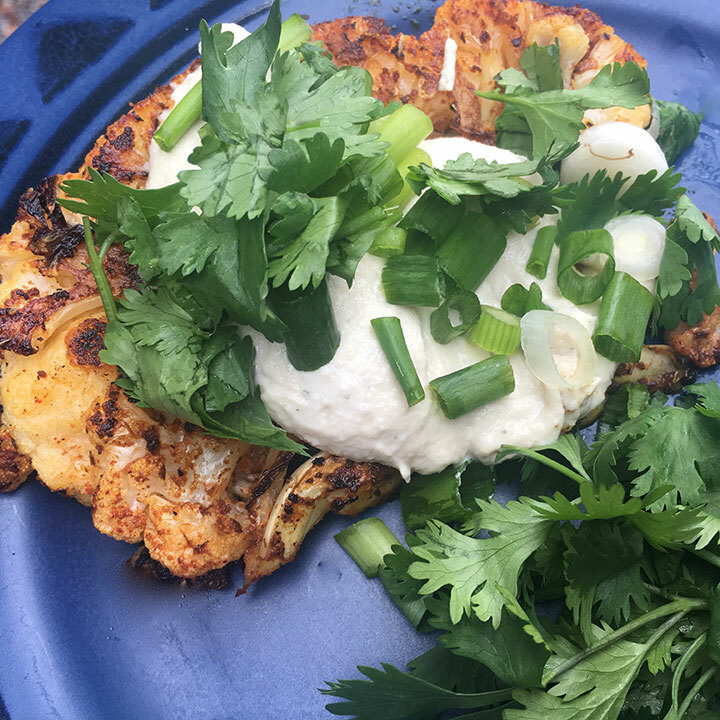 Cauliflower steaks make a great center of the plate entree. Lightly oil thick slabs of cauliflower then season and grill them until tender. Serve them topped with a cashew cream and freshly chopped green onion and fresh herbs. Vegan Mexican food, always a winner. You can have it all again by just simply switching out a few ingredients and leaving out the meat and dairy. 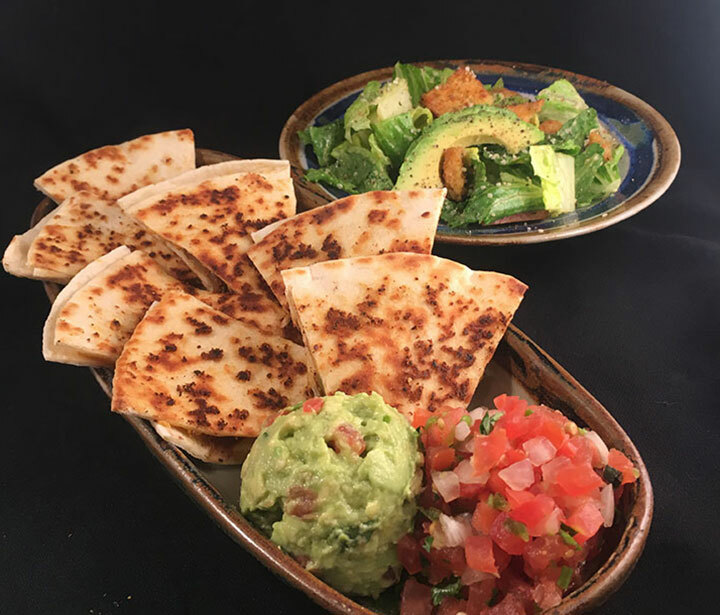 These super veggie stuffed “cheezy” quesadillas are served with fresh sides of Jensen’s house made guacamole, pico de gallo and a vegan caesar salad to make one incredibly satisfying meal. Learn the fundamentals of making vegan sausage from scratch and discover how these basic techniques can be duplicated to make a variety of sausages. Vegan sausage is used just like regular sausage; crumble it, slice it, grill it, serve it on a bun. Lots of versatility and satisfaction with this recipe. A classic dessert, veganized. The surprise base ingredient is a firm organic tofu blended with dark chocolate, cashews, maple syrup, vanilla, and a non-dairy milk all on top of a chocolate almond crust. With the switch of just a few ingredients you can have it all again. 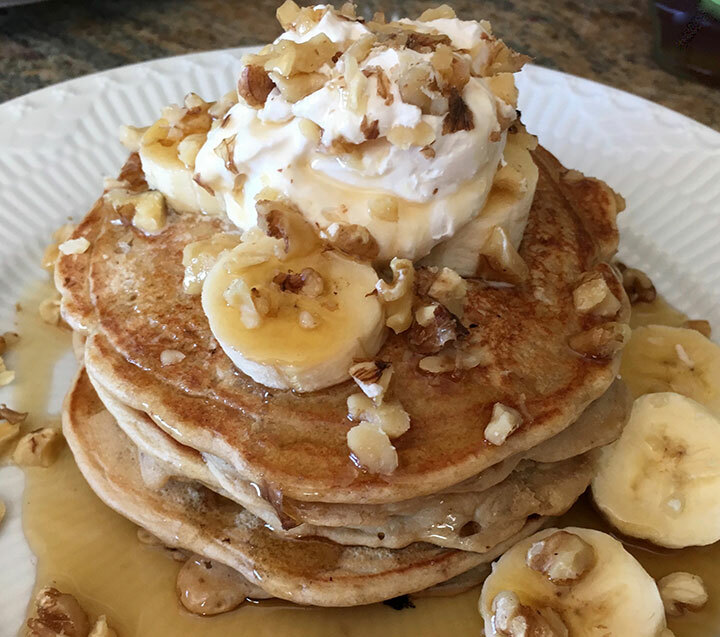 No one would know the difference, substitute the traditional milk for non-dairy milk, the eggs with tofu or flax seed, the butter with vegan butter and the whipped cream with coconut cream. 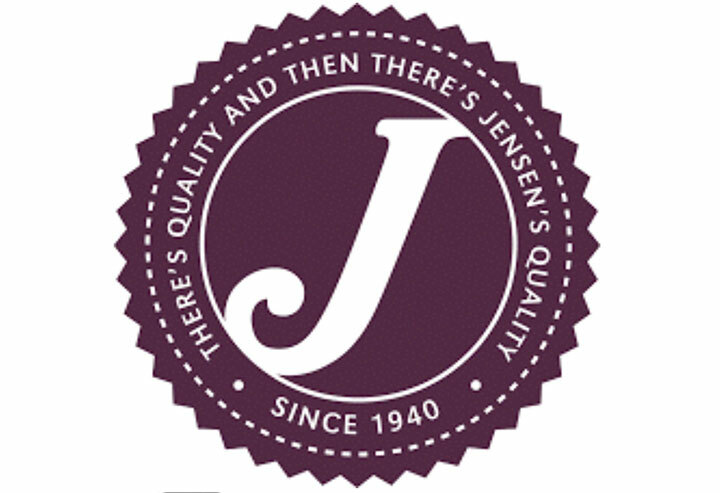 No cholesterol, no animals required…yet all the same flavor and satisfaction. Master the tofu scramble for a variety of great breakfast options. 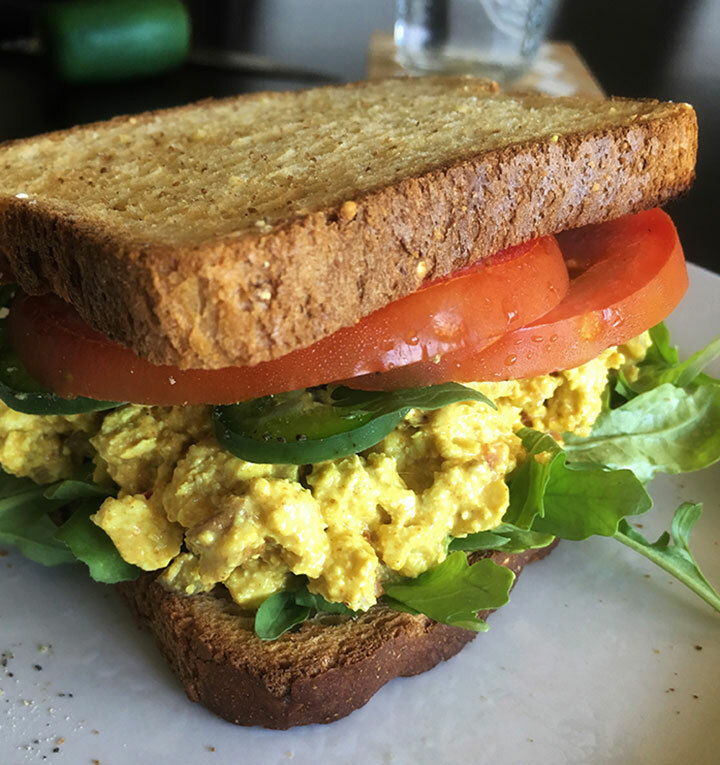 Tofu scrambles are great in breakfast burritos, on top of chiliquilles, they can be made with any variety of seasonal vegetables and used as a protein rich entree for any meal. 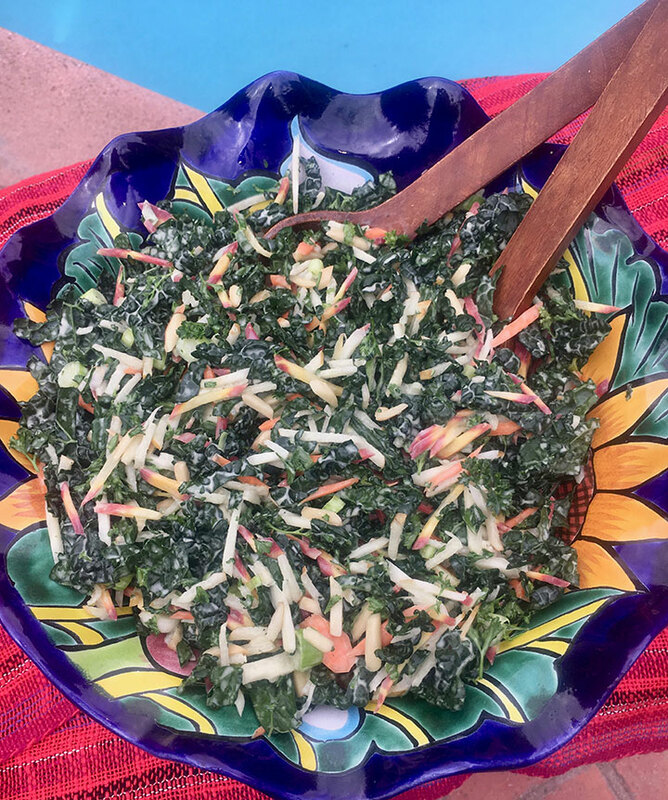 This slaw is so simple, delicious, and satifsying…enjoy it as a meal by itself! The combination of crunchy vegetables and toasted almonds with the creamy tartness of the simple vegan mayo and apple cider vinegar dressing make this an easy to prepare, high octane, nutritious side dish or meal. All the decadence and satisfaction without any of the cholesterol. This incredibly rich breakfast entree is a winner. 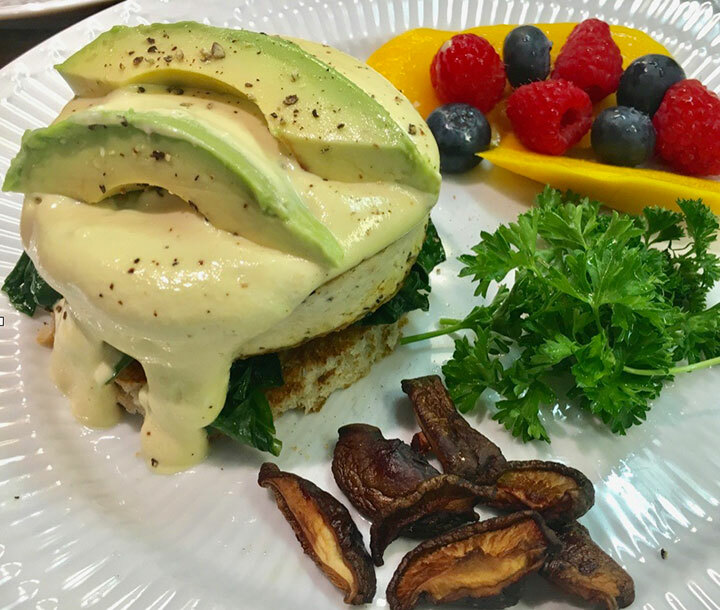 Served on a toasted english muffin with a base of freshly steamed spinach or kale, grilled tofu, vegan hollandaise sauce, freshly sliced avocado, shitake mushroom bacon, and a side of fresh fruit…there’s nothing left to be desired. Impress your friends with a fresh plant-based version of a traditionally meat and seafood heavy dish. 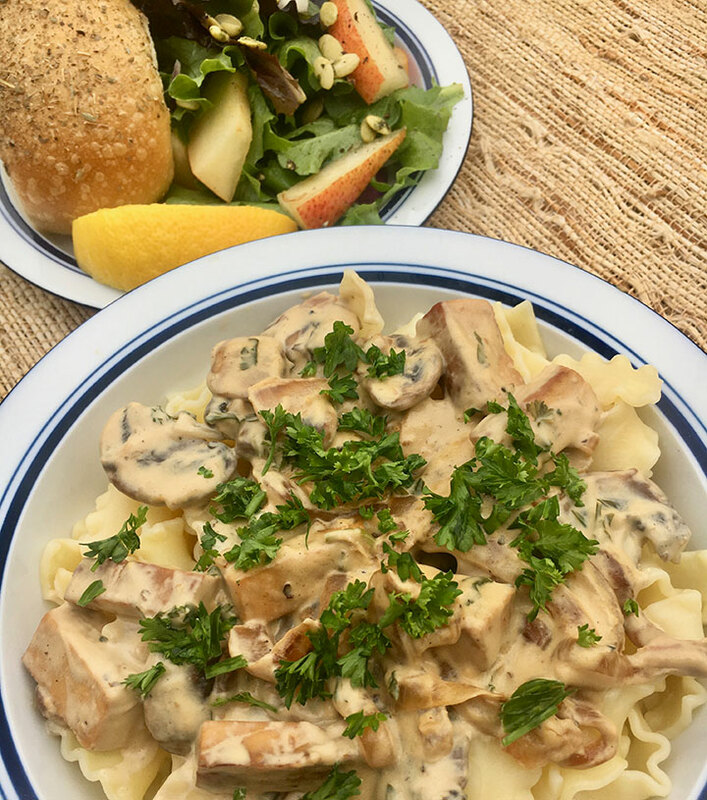 Make it all veggie with artichoke hearts and hearts of palm to take the place of seafood, try adding vegan sausage and you’ll find you can have it all again, plant-based. This decadent chocolate cheesecake delivers flavor, all the familiar texture and satisfaction. Life is short, have dessert first! 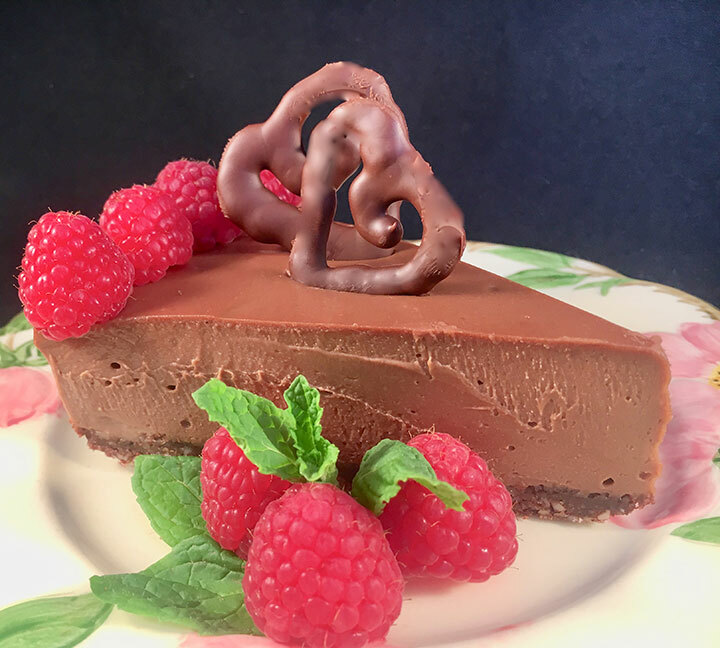 Master the art of making vegan cheesecakes and you’ll be amazed at the new options you have that don’t require any dairy products, are cholesterol-free, and environmentally friendly. Love, love love! All the flavor and texture of meat, plant-based. Wheat meat is made from vital wheat gluten or the protein from wheat, and it’s easy to make. It looks like meat and tastes like it too, use the marinade in the recipe or just sprinkle carne asada or any seasoning on your wheat meat, grill it, chop it and put it in tacos. A smokey black beans, sweet potato, and veggie patty topped with vegan cheese. Easy to make and both kids and adults love them. 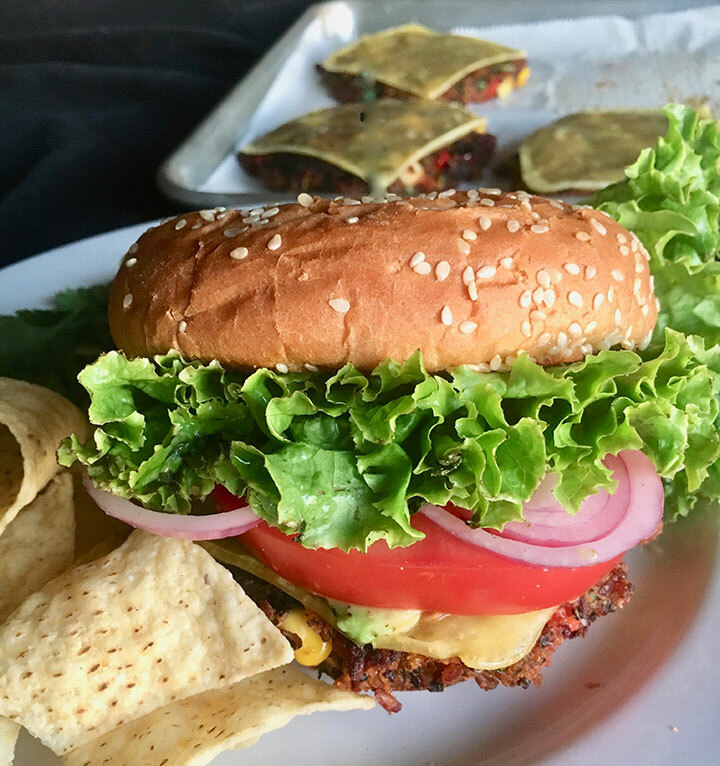 Slip your kids their their veggies with baked or grilled black bean veggie burgers and watch them eat them up! Lentil taco meat, fresh pico de gallo, greens, and quinoa make this a complete meal. Plan meals in advance and cook up these great recipes that can be used together to make a buddha bowl or by themselves as part of additional meals through the week. Discover how tofu can be used as a substitute for eggs and no one will know the difference. Take traditional recipes and veganize them by replacing the butter with vegan butter and the eggs with tofu. 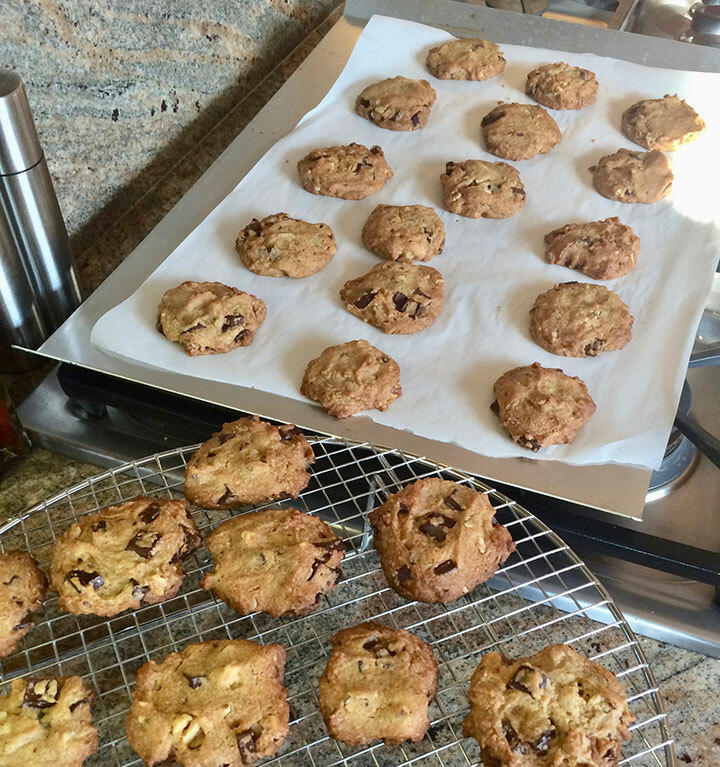 Replace each one egg with 1/4 cup firm tofu, cream it well with the sugar and butter and you’ll have cholesterol-free chocolate chip cookies everyone will love.